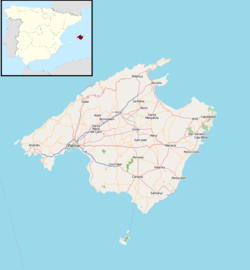 Alcúdia (Catalan pronunciation: [əlˈkuðiə]) is a municipality and township of the Spanish autonomous community of the Balearic Islands. It is the main tourist centre in the North of Majorca on the eastern coast. It is a large resort popular with families. Most of the hotels are located in Port d'Alcúdia and Platja d'Alcúdia along the 14 km long beach that stretches all the way to Can Picafort. In Alcúdia the old town is well preserved with houses dating back to the 13th century. The old town is surrounded by a medieval wall. The old town of Alcudia is famous for its small restaurants. View over the remains of Pollentia and the church of St. Jaume. The area where Alcúdia is located has been inhabited since the Bronze Age, but it is with the arrival of the Romans that the city makes its entry in the history books. The Romans used the beaches of Alcúdia bay when they captured the island in 123 B.C. Shortly after this the capital Palma was founded and then the city of Pollentia. From Pollentia it was possible to view both the bay of Pollenca and the bay of Alcúdia. Pollentia served as a guard for other invaders. The city was also mentioned in Rome since they here produced excellent fabrics that were used in the most exclusive togas. After Rome lost its position as the dominant power in the western Mediterranean, Pollentia was attacked by pirates and several times by the Vandals. Finally, the city was abandoned, and the remaining population left to create a new town at a more protected location. This town became Pollenca and the area where Pollentia stood was left to ruins. After the invasion of the Moors, a farmstead was created very close to where the ancient village of Pollentia had been. The farm was called Alcúdia, which is Arabic for "on the hill". In 1229, the Moors were defeated by King James I of Aragon, who overtook the power of the area. In 1298, King James II of Aragon bought the farmstead Alcúdia and founded the new town. A church, a graveyard, a house for priests, and a square were created in the same year. The construction of the walls was also initiated at the same time and finished in 1362. The city plan that was made at the time remains the same for Alcúdia today. During the Renaissance, walls were reconstructed, and a second wall was constructed outside the first one. This wall has since been torn down and only details show where it once was. During the 16th century pirates attacked the city several times. The population shrank, and there was from time to time a risk that the city would be abandoned totally. In 1779 a decision was taken to support the city by constructing a harbour. This really improved the economy of Alcúdia and the village was saved. But it remained a rather small and poor village. In the 1920s the first tourists began to visit Mallorca and also Alcúdia. This was in a very limited scale and the economy of the village stayed weak. In the early '70s it started to be clear that the future of Alcúdia would be in tourism. 15 years later the old harbour of Puerto de Alcúdia had developed into a major resort for European tourism. In the '90s the construction boom calmed down and several regulations were put in place to secure the quality of the resort. The focus is on visitors searching for both relaxation and activity. A golf course has been constructed and both bicycle and hiking trips are commonplace. The old town has been preserved and pedestrianised. It has now become one of the most visited villages in Majorca. The old town has a 14th-century wall and it is possible to step up on the wall and follow it almost all around the village. There are remains of a Roman town just outside the medieval town walls, in front of the Church of St. Jaume, belonging to the ancient city of Pollentia (see also the Italian Pollentia). There is also a small Roman theatre. North of the town is a bull ring from the 19th century. The old town also hosts a market both on Sundays and Tuesdays all year round. Inside the walls there are several popular restaurants and bistros famous for good home-cooked food in small settings. In Port d'Alcúdia most of the restaurants are located around the marina. Most of these restaurants are only open in the tourist season. Further north and west are some coves and beaches ideal for sunbathing, swimming or snorkeling. The beach at Alcúdia is c. 14 km long and stretches as far as C'an Picafort. Alcúdia joins onto Playa de Muro which is home to S'Albufera; a natural park that is very popular with birders. Alcúdia celebrates the festival of St. Jaume every summer. It goes on for nine days at the beginning of July. Before the festival starts the town is decorated and each street picks out a theme for that year's look. During the festival several traditional evening festivities are arranged in the old town such as the Night of the Romans where the streets are full of locals dressed in traditional ancient Roman dresses. There are also outdoor theatres, sport tournaments, exhibitions and the traditional bullfight. The fiesta is finished with La Noche de Sant Jaume, a fireworks display and philharmonic concert by the old walls. Alcúdia hosts also many other fairs and festivals throughout the year. During the summer, there are plenty of al fresco events, with dramatised tours of the old town, and theatre productions in the old Roman amphitheatre. The Alcúdia Jazz Festival starts at the end of August and runs for a month. International sporting events are held down the road at the port, with an Ironman Triathlon twice a year, beach volleyball and beach rugby... There is an agricultural fair in the Autumn at the beginning of October and a nautical fair in April, which features the cuttlefish. Taking place every three years is the Triennial of Sant Crist, a religious procession where the population slowly walks barefoot through the town in silence, for several hours. The origin of this procession dates back to 1507. According to tradition, the image of Sant Crist sweated blood and water, thus putting an end to a drought. Alcúdia is home to UD Alcúdia who plays at Els Arcs, which has a capacity of 1,750. Alcúdia is home to one of Europe's largest hotel complexes, Bellevue. With 8 swimming pools and 17 apartment blocks the complex is set in 150,000 square meters of gardens. Wikivoyage has a travel guide for Alcudia. 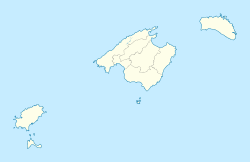 Wikimedia Commons has media related to Alcudia.